So what do you do when you want to make your sweet-toothed husband something fudgy, decedent, and healthy? You begin the online research and make up your own twist, that’s what you do! Behold! 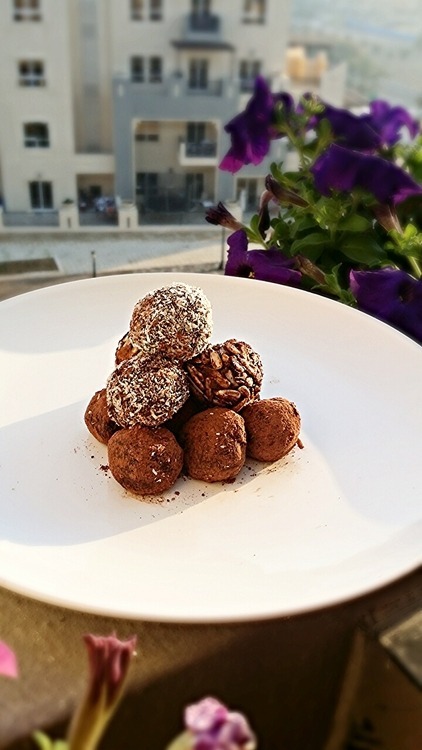 My easy chocolate truffles that are packed with protein, fiber, and all around goodness—sure to give you that energy boost you’ll need for a busy day, while curbing any cravings for junk you might get. This recipe is sugar-free, guilt-free, and full of antioxidants. I think it’s worth mentioning that you could easily substitute the powdered almond, pumpkin seeds, and sunflower seeds for one of the other. You could even substitute them all for powdered oats. – Soak the dates in hot water for about 15 minutes. Then drain, pit, and place in a food processor or blender. – Melt chocolate with a little bit of milk and add to dates. – Add all the other ingredients. – Blend till dates are completely blended, and the whole mixture is completely incorporated together. – Place in a clean bowl. – Begin rolling into small balls. (If the mixture is too wet to form balls, add some wheat bran and/or cocoa to thicken it up. If it’s still too wet, place in freezer for 20 minutes). – Roll balls (hehe) in cocoa powder, seeds, or shredded coconut. – Place balls in an air tight container. It should last for about 5-7 days when refrigerated, but as a general rule of thumb, they usually get eaten long before that. Go straight-up bananas and give this recipe a go! I’d absolutely love to hear from you!